What is the Condition Book in Thoroughbred Horse Racing? The condition book is a list of the type of races offered on a designated day. The “book” usually comes out one-two weeks in advance and covers races for a two-three week period. 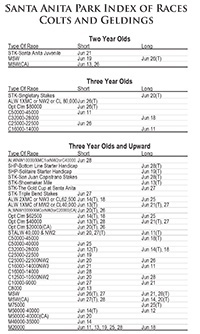 For example, on Tuesday June 2, 2015 the new Santa Anita Condition book was released covering races from June 11, 2015 - June 28, 2015. The book is written by the racing secretary - who knows every horse in the circuit (especially those in horse racing partnerships!). Santa Anita racing secretary Rick Hammerle otherwise known as the Hammer must know every horse on not only the Santa Anita back stretch but the other training facilities as well (ie Los Alamitos and San Luis Rey). His job is to fill the races with as many horses as possible so naturally he writes races he believes will accomplish this. The book will list 8 races for Thursday and Friday and 9 for Saturday and Sunday - the anticipated number of races on those days. Each day may also list a number of substitute races or “sub races”. The racing secretary generally uses the listed races first but has the flexibility to swap in a sub race if one of the listed races “doesn’t fill” (ie 5 or more horses are not entered) or he just believes the sub race is better for the card. Yes, the racing secretary is the gate keeper. They don’t call him the Hammer just because it’s part of his last name! Each race lists the exact conditions of the race - purse/class/weight assigned/distance/surface. 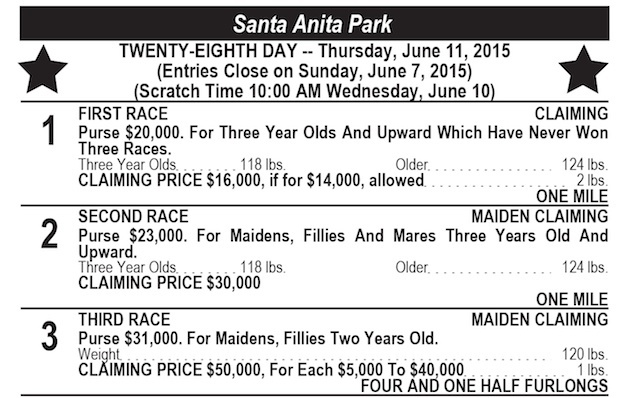 One minor note, although it lists them as “First Race” “Second Race” this is NOT the actual race day order. The racing secretary designates race order AFTER the card is filled. The order of races is usually determined by the number of entries in each race with shorter fields going earlier and bigger fields later in the day. This is done for gambling purposes. More money is traditionally bet on races with bigger fields and tracks believe the most money available to bet is later in the day. Filling a day of races - or race card - takes patience and many times lots of creativity. The racing secretary has ultimate authority to mix and max in order to present the best race card. For example, if a listed race doesn’t fill (but maybe has 4 horses), he may “bring it back” the next day as a new sub-race. He then will lobby trainers and owners of thoroughbred partnerships for the next 24 hours to fill the race. Owners and trainers are sometimes enticed to run a horse they otherwise might not have if they know - for example - there might be small field in the race. The book also lists deadlines for entry and reminders on when nominations of stakes races will close. Anything relevant or of importance during this period is usually listed in the book. It also lists an index of all the races in the back of the book. 8 or 12 days usually covers over a 100 races when you count the subs. This index summarizes the conditions offered and is usually the first place a trainer or manager of thoroughbred partnerships starts. There are two indexes, one for colts and one for fillies. As you can see there are many classes of races and we will explain the different classes in the next blog.